Almost 50 thousands Americans will be diagnosed with oral cancer this year. Unfortunately, just over half of those patients will survive for over 5 years. The high death rate associated with oral cancer is largely due to the fact that it’s “routinely discovered late in its development.” The tragic part is that much of this hardship could be avoided because the symptoms of oral cancer aren’t usually difficult to diagnose. That’s why the routine cancer screening that we provide during every checkup could be the most important part of your visit. When it comes to oral cancer, early detection is crucial. You cancer screening only takes up a small portion of your hygiene visit. In fact, it usually lasts about 5 minutes. During the screening, Dr. Klym will examine your head and oral cavity. Eighty-five percent of oral cancers begin in the oral cavity. Dr. Klym will begin your cancer screening by a taking a careful look at the floor of your mouth, your hard palate, soft palate, cheeks, lips, tongue, tonsils, neck, and larynx. 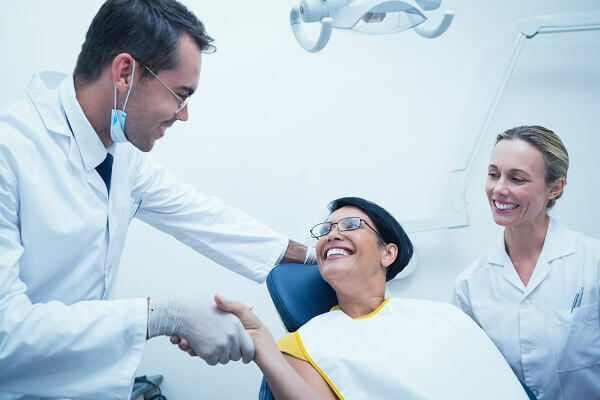 Our Traverse City dentist will also examine your head, cheeks, and the area below your chin and around your jaw, checking for unusual masses of tissue. If anything out of the ordinary is detected, we’ll refer you to the appropriate doctor right away. Every patient needs to be screened for oral cancer at least once a year. There are risk factors such as smoking and drinking alcohol that significantly increase a patient’s likelihood of contacting oral cancer. However, a substantial percentage of patients who contract oral cancer neither smoke nor drink. No one is immune from this disease. If you notice any sore or discolored area or growth in your mouth that does not heal within 14 days, you should contact our office right away. Other symptoms to look out for include a lump or unusual mass of cells that can be felt in any part of the head or oral cavity. Persistent discomfort or pain experienced while you’re speaking, swallowing, or chewing can be a cause for concern. You should also be on the lookout for unusual growths in the head. Numbness in the face, neck, and oral region or an earache that refuses to go away should also be looked into. Don’t hesitate to contact our office in Traverse City if you notice any of these symptoms. At Northwood Dental, we offer a comprehensive dental care, including preventative, restorative, and cosmetic procedures. Make your appointment today and find out what our dental implants and other services can do for your smile.